If you’re satisfied with your new toilet, but feeling less than thrilled about the factory seat, you’re not alone! Most factory toilet seats are crappy pieces of plastic that don’t exactly make you comfortable. When we set out to review toilets for this site, we pay attention to lots of different factors. First and foremost, we check for powerful flushing functionality. Then, we take a close look at things like efficiency, build quality, and reliability. Those factors are all indicators of a throne’s objective quality! They don’t tell the whole story, though! Whether or not you actually enjoy having a toilet in your house also depends on how it feels to actually use the thing. And while all the models we recommend come in comfortable heights and designs, seat preferences are totally subjective. So, for this short buying guide, we’ll introduce you to a few upgrades you can easily make to your commode! They’ll take the comfort factor to the next level. Some will do even more! If you’ve got a loose, rickety, or cracked factory seat on your hands and need a cheap replacement, look no further than the Bemis. There’s nothing particularly special about the Bemis but it’s an American-made workhorse. It installs very easily, and comes with everything you need to swap out your seat. It also fits snugly once it’s on. You shouldn’t have any more problems with sliding or wobbling. It has a nice, generous rim to keep you comfortable. There are no annoying ridges or sharp bits, either. Everything’s smooth and contoured. You’d be surprised how many toilet seats don’t meet those basic criteria! One area where the Bemis certainly stands out from the competition is its build quality. Sure, this is a cheap plastic seat, but it’s thicker than most factory components and has a solid track record. The plastic cleans easily, doesn’t crack, and doesn’t discolor quickly. It comes in both round and elongated versions. You can find links to each above! For many larger folks, as well as some average-bodied users, the standard factory-issue toilet seat is way too small to be comfortable. That’s when you want to turn to the Big John! There are plenty of oversized options on the market, but we think this one’s the best by a long shot. It fits on a standard toilet and expands your seating area to a much more generous 19″. You can use this on the majority of round and elongated toilets, including any of our recommendations. If you find standard seats cramped, we think you’ll love this thing. It contours nicely to all the edges. It sits taller, too, because of its rubber bumpers. The rubber bumpers under the seat are primarily designed to keep the seat from shifting. They also serve to add a bit of cushion, as well as making things more comfy for taller folks. Beyond simply being more comfortable for many folks to use, the Big John handles weight better than any factory component. If you’ve run into problems with cracking or warping seats before, it’ll be right up your alley. It has a an 800-pound weight limit! The ABS plastic material is thicker and stronger than usual. Another big discomfort for many people is the feeling of a cold toilet seat. To be sure, there’s nothing relaxing about sitting on cold, hard plastic! If you want to ditch that forever, pick up this Brondell seat! There are a lot of heated options out there, but the Brondell has a better reliability record than the competition in its category. It’s also simply a great toilet seat, heating features aside. It fits snugly, doesn’t shift, and stands up well under weight. You get three different heat settings to choose from, plus an option to turn the feature off entirely. We also love the integrated night light. It saves you having to turn on bright fluorescents when you go for a late-night loo trip. And you don’t have to worry about wasting electricity by leaving it on. The LED bulb actually uses less energy than your fluorescents do! You can get this one in both elongated and round versions. They’re listed together, so just follow the links above and select the option that suits your throne! Of course, when it comes to comfort on the loo, there’s no competition. The Japanese have been killing it in this department for decades! Their toilets are unbelievably pleasant to use. By integrating bidets, they actually clean you up in a more sanitary and thorough way than you could manage with TP. They also heat the seats, ventilate unpleasant odors, and more! Short of buying a premium toilet direct from Japan, your best bet is to get a Toto Washlet seat. These seats give you the bidet, heating, and deodorizing features of a Japanese toilet, fitted over a standard US throne! One of the most affordable you can get is the C100. We love the C100 because it includes all the basic features of the high-end Washlet’s without as high a price tag. You get seat-warming functionality, a pre-misting feature, and completely adjustable bidet operation. In fact, this is highly adjustable for something so inexpensive. It also demonstrates the smart design that makes Toto fixtures so great. The bidet wand cleans itself both before and after each use. The seat will also dry you after it cleans! There are certainly some reasons why you might want to consider investing in one of the more expensive Toto models, though. For one thing, the C100 doesn’t have eWater, which is Toto’s electrolyzing feature. It sounds a bit gimmicky, we know, but it does a noticeably better job keeping the toilet clean between uses. It doesn’t have a remote control, multi-user preferences, or any of the premium features you’ll find on the nicer Washlet’s either. This Washlet is our recommendation to the average buyer who’s interested in a bidet-integrated seat. It incorporates a lot of the deluxe features from the $1000+ Toto models without going too extravagant in the price department. A lot of the basic features are the same as you’ve seen on the C100 above. The S300e pre-mists, has a seat-warmer function, and cleans itself. However, it adds tons of conveniences that make it feel like much more of a spa experience! One of the biggest differences is the fact that the S300e comes with a remote control. Yes, we know, that’s never the reason you buy a massive appliance, but it’s a lot more convenient than you might think when you actually get down to using it! We also love being able to program in preferences for multiple users. You can select your settings all at once when you sit down to use the toilet, and have a customized experience when you finish. There’s a fun pulsating cleanse option, too. There are automatic features and conveniences all throughout this model, which we think do help to justify the higher price tag compared with the C100. The lid opens and closes automatically, for example. It’s one of those features that is relatively small but makes the whole experience feel that much more magical and futuristic. It also heats water instantaneously with a tiny tankless water heater in the pipework. That’s extremely handy, since you don’t have to worry about waiting for the system to heat up. It also allows you to change temperature settings pretty much immediately. The best thing about this is the eWater function. It electrolyzes the water going through the Washlet before using it to spray down the bowl. You won’t notice any real difference when the system cleans you. Your toilet bowl will stay noticeably cleaner for significantly longer, though! Our ultimate recommendation for toilet comfort is the Toto Washlet S550e. It’s a top-notch bidet seat that’s about as good as you can get without shelling out several grand for a full Japanese bidet/toilet combo. We know those are beyond the means of most shoppers, which is why we recommend this as the next best thing. Choose this is you want a deluxe, premium experience that can’t be beat for under $2K. The S550e has more settings, features, and conveniences than the other Washlet models we’ve recommended above. It keeps the eWater feature from the S300e, and adds a wide front washing function, a night light, and more. There’s even an air purifier built into the dryer! It cleans you more effectively and your toilet to boot. You can customize settings for two users on the deluxe remote. We also like that each feature has more adjustment settings than the cheaper Washlet models. There’s more variety and much more room for you to create your ideal toilet experience. Which of these toilet seats should you buy? The Bemis is the obvious choice if you’re on a budget and don’t need anything special from your new throne component. It’s simple, straightforward, and sturdy. There’s nothing special here. On the other hand, the fact that it’s so unremarkable is proof that it’s a good toilet seat! When you don’t notice yours, chances are it’s working pretty well. The Big John is our recommendation to any buyers who know that they’ll need a jumbo-sized toilet seat to be truly comfortable. While it’s too large for most users, it’s ideal for heavier folks who want a wide, stable platform that won’t collapse or bend under a lot of weight. It fits standard toilets pretty easily. Don’t get this unless you definitely need a jumbo throne, though. Aside from being much larger, there’s nothing too remarkable here in the comfort department. The Brondell is a good choice for the average person who wants a toilet seat with a few amenities without spending a few hundred dollars for a bidet combo. It’s loaded with a very effective seat-warmer and a comforting night light. We think it’s as comfortable as toilet seats come short of adding bidet functionality. Our number one choice for the most comfortable toilet seat is the Brondell Luma-Warm – is there anything more pleasant than a cozy warm throne? 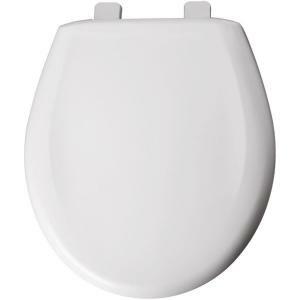 The Toto Washlet C100 is the best choice for getting a bidet toilet seat without spending a lot of money. There are cheaper Toto Washlet models available, but this is the best way to get the complete experience without spending more than $500. It covers all the basics of bidet functionality in a reliable, user-friendly package. Spend more if you want all the deluxe perks, though! The Toto Washlet S300e is a nice midrange option for bidet fans who want some more perks without breaking the $1200 threshold. It’s more customizable than the C100 and the multi-user support is perfect for couples. We especially like the fact that it has a tiny tankless water heater built in. It’s not the best of the best in this category, though. If you’re prepared to go all-out and splurge, we think the Washlet S550e is the ultimate bidet toilet seat right now. The Toto Washlet S550e is the most deluxe bidet/seat combo we recommend at the moment. It’s the next best thing to a full Toto toilet/bidet combo. We know this is an extremely expensive model, but it’s worth it if you love bidets and will appreciate all the perks of having a premium model. For the vast majority of buyers, it’s probably overkill as well as out of reach. As you can see, you can make a huge difference in the comfort of your loo by upgrading the seat! Still, there’s no compensating for a crappy toilet. If you need help finding a high-quality throne, check out our homepage! It’s the best place to find in-depth reviews and comparisons of the best toilets on the market: https://homeworthylist.com/.